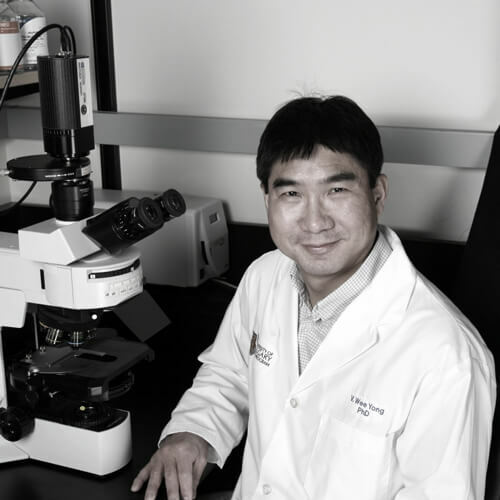 Dr. V. Wee Yong is a Professor at the University of Calgary, Canada, and the Canada Research Chair in Neuroimmunology. He co-directs the Multiple Sclerosis (MS) NeuroTeam of the Hotchkiss Brain Institute at the University of Calgary, providing the basic science leadership, and he directs the provincial Alberta MS Network. Dr. Yong’s research interests lie in the area of neuroimmunology, neuroprotection and CNS regeneration, and his projects are guided by MS, spinal cord injury and brain tumors. Dr. Yong has published 280 peer-reviewed manuscripts and his research has been translated into Phase III clinical trials in MS and spinal cord injury. His work has been cited over 17,000 times by other authors (web of science; h-index of 74). Dr. Yong is a past chair of the Medical Advisory Committee of the MS Society of Canada; this and other volunteer activities resulted in him receiving the Queen’s Golden Jubilee Year Medallion. Dr. Yong is on the editorial board of 7 international journals. He has been the President of the International Society of Neuroimmunology (2014-2016). Dr. Yong is an elected fellow of both the Canadian Academy of Health Sciences and the Royal Society of Canada, which represent top honors for those working in the medical and academic sciences, respectively. Dr. Yong is the 2017 Allyn Taylor International Prize in Medicine winner.